Egypt's President Abdel Fattah El-Sisi and Russian President Vladimir Putin have signed an agreement for Russia to construct a nuclear power plant to generate electricity in Egypt, the Ahram Arabic news website reported on Tuesday. The power plant is one of several potential industrial and trade deals discussed during the Russian state head two-day visit to Egypt. At a press conference on Tuesday, Putin said that "if final decisions are reached" regarding the power plant, construction would start straight away. He said the project would include capacity building and studies. Egypt's El-Sisi said Russia had great experience in nuclear power. Cairo has sought to strengthen its ties with Moscow, against the backdrop of strained ties with its long-time ally Washington, since the ouster of Islamist president Mohamed Morsi in July 2013. "The cooperation never ended and never will end, " El-Sisi said at the press conference. "We see in Russia a strategic friend and a real asset to balanced foreign relations for Egypt." The heads of the two countries also discussed "endorsing military cooperation" and a collaborative approach to combating the "spread of terrorism". Other investment projects are to include an Egyptian-Russian industrial zone to be established in Suez Canal area and infrastructure development. Tourism and education are also possible forms of cooperation, Putin said, adding that around 3 million Russians visited Egypt in 2014, a 50 percent increase compared to past years. "This indicates the positive outcomes of stability obtained after El-Sisi took office," Putin said. Putin last visited Egypt a decade ago in 2005, when Hosni Mubarak was president. 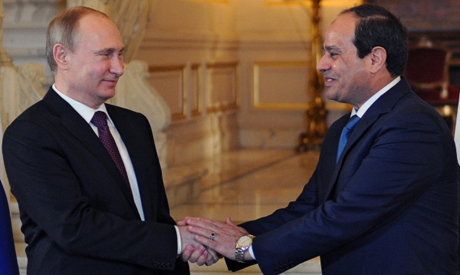 El-Sisi visited Moscow twice last year, first as defence minister in February, then as president in August. The agreement is s statement of intent only. It is not a binding contract with terms, conditions, timeline, or price. How will this project be funded? Are there better uses for the money being spent (even if barter)? What other countries had the right to submit an alternative proposal or lower bid? Egypt has so many fantastic options. why choosing this dangerous technology? where to bring the contaminated garbage? In the desert? why doing the same horrible mistakes like America, Europe, Japan, Russia? Didn't we learn anything from Tschernobyl and Fukushima? Don't do it! For the sake of our children! Nuclear reactor designs are much safer than they were 5 years ago, let alone 30 or 40 years ago. Well trained and certified Egyptian workers are far smarter and more productive than many other nationalities. We can definitely operate a nuclear reactor. With huge desert area and free shining Sun they should focus on building solar plants. It takes up to 3 years to build and its ready to operate instant. Nuclear plant takes approximately 10 years to build and other few more to start operating. I understand there is urge for nuclear power in troubled world, but risk is to high!!! Tourismus ausbauen für Russland? Das ist der Untergang des Kulturtourismus, die Rote Meerregion versinkt schon jetzt unter den betrunkenen Russen die zu anderen Gästen nur unhöflich und laut sind. Die Gäste aus anderen Ländern werden das Rote Meer wegen den Russen meiden und auf andere Länder ausweichen. Aber ihr habt Glück denn für euer schönes Kultererbe interessieren die Russen sich nicht sonst würde Kairo im Wodka ertrinken. Und wenn ihr Tschernobyl an einer der wichtigsten Einnahme dem Suezkanal haben wollt, dann vertraut ruhig auf der guten Russen Technik. El-Sisi is the only bright leader in the Arab-Muslim world, and anybody can do business with him but Washington. His relationship with the Obama administration came to an end when El-Sisi demolished the Muslim Brotherhood terrorist organization and frustrated Washington for jailing Morsi, a terrorist leader. What can Obama do now as he sees Egypt is falling into the hands of Vladimir Putin, and Yemen into the Iranian hands? They are with Israel and they are just trying to loot Egyptian money. At the inception of his Presidency he said we all need to work hard to build Egypt back to its glory days. He has been doing just that, I wonder if all Egyptians are doing the same. His greatest acheavement however has been to disinfect Egypt from the Muslim brotherhood terrorists, and put them out of business of destroying Egypt and Egyptians. In short he is doing everything he said he will do. Dear "ALLEN". Pesumably then the dozens of deaths and acts of terror that have occurred so far this year are NOT attributable to the MB? Someone is still in the business off "destroying Egyptians" with impunity it seems. they want their anti-Sovjet propaganda back.